Doesn’t dietary fat ‘clog up’ the arteries and cause coronary disease? It would seem from popular press that this has been proven beyond a shadow of a shadow of a doubt. Perhaps we had better take a closer look. The Diet-Heart Hypothesis suggests that diets high in saturated fats lead to high cholesterol which leads to heart disease. In our last post, we’ve seen that there is actually no connection between high fat diets and high blood cholesterol levels. The connection between high blood cholesterol and heart disease is also a bit dodgy, only to be saved by the distinction between ‘good’ and ‘bad’ cholesterol. Dr. Ancel Keys, the prominent nutritionist was one of the first men to theorize about a relationship between dietary fat and heart disease. This was based on his correlation studies between nations. While he most certainly cherry picked the data to strengthen his argument, nevertheless there was a relationship there. This, in no way, means that dietary fats caused heart disease. Any number of factors could contribute. The increase in dietary fat may have been a marker for industrialization. The more industrialized a nation, the higher the rate of heart disease. Other research groups sought to replicate these results. Despite another two decades of data, there was no relationship between dietary fat and heart disease to be found. This is despite some trials boasting over 10,000 patients and over trials lasting over 20 years long. But the myth persisted. 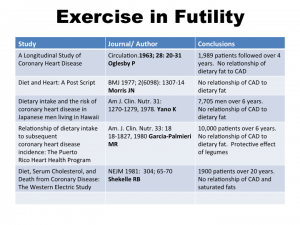 No amount of data could persuade the diehards that dietary fat did not cause heart disease. Moving into the modern age, it was recognized that one of the major problems in much of the older literature was the grouping of trans-fats with saturated fats. What are trans fats and how did they come to be? Trans-fats are made from poly-unsaturated vegetable oils. Most vegetables are not naturally oily. Olives and coconuts are exceptions, which is why these two oils predominate in much traditional cooking in those parts of the world. However, corn is not particularly oily. It requires significant amounts of processing in order to get enough oil from them. The oil that comes out is polyunsaturated, meaning that there are multiple ‘holes’ where hydrogen is ‘missing’. Saturated fats, like many animal fats are saturated with hydrogen. Because these are saturated, they are more stable and also tend to be a solid at room temperature. The polyunsaturated fats with their ‘holes’ are not as stable and therefore tend to go rancid. In 1902, Wilhelm Normann discovered that you could bubble hydrogen into vegetable oil and saturate it with hydrogen. This essentially turned the polyunsaturated fat into a saturated fat. On labels, it is often called partially hydrogenated vegetable oil – yeah, that’s trans fat. This made the fat more stable chemically. It changed the oil into a semi-solid at room temperature – that’s great for spreadability. This made it more appealing to food processors since it improved mouth feel and also increased shelf life. Trans fats were great for deep frying as well. You could use this stuff over and over and not have to change it. The saturation of the hydrogen bonds made this much more stable chemically than the polyunsaturates. The other key piece was that this stuff was CHEAP. Using leftover soybeans from animal feed, manufacturers could process the heck out it and get oil. A little hydrogen, a little chemistry, and boom – trans fats, baby. So what if it killed millions of people from heart disease? That knowledge was years in the future. Crisco, the shortening made from hydrogenated vegetable oil debuted in 1911. This would replace lard – the rendered fat from a pig in many recipes. The manufacturer, Procter and Gamble was quick to point to the ‘wholesomeness’ of an all vegetable product and Crisco soon entered pantries everywhere. One of the main attributes is the shelf life stability of the product. I have some that is about 5 years old that looks the same as the day I bought it. By the 1960s, as the nation began to worry about heart disease, the trans fats were starting to really hit their stride. 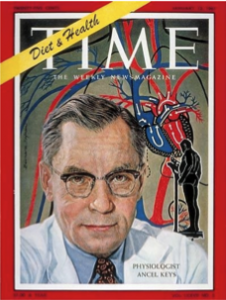 Dr. Ancel Keys, cover boy of Time magazine, proclaimed saturated fats as the main cause of heart disease. Trans fats were quick to point out that they were processed from polyunsaturated fats – the ‘heart healthy’ fat. Since many animal products also got the blame for heart disease, the all vegetable nature was touted as ‘heart healthy’ as well. So, use of saturated fats – beef fats and pig fats – gradually decreased. Butter was under intense fire as well. Polyunsaturated fats, with their rancidity and short shelf life were not suitable for processed foods. The logical alternative was the trans fats. These were called partially hydrogenated vegetable oils. So they retained the healthy sheen of being a vegetable oil, but were the completely artificial Frankencreation of science gone awry. Margarine, another completely artificial food, embraced trans fats like a long lost lover. The two wholly fake foods were made for each other. McDonalds and other fast food chains switched from frying in ‘unhealthy’ but delicious beef tallow to frying in trans-fat vegetable oils. The major sources of trans fats were deep fried and frozen foods, packaged bakery products, crackers, vegetable shortening, and margarine. The beginning of the end of the trans fat reign started in 1990, when Dutch researchers noted that trans fats increased LDL, the ‘bad’ cholesterol and lowered HDL the ‘good’ cholesterol. From there, it was an endless parade of bad news for the trans fat. By 2006, an American Heart Association poll showed that 84% of consumers had heard of the associated health risks. The FDA demanded food labels. Dr. Willett estimated that a 2% increase in trans fat would result in a 23% increase in risk of heart disease. Trans fats were contributing to thousands of heart attacks and strokes. In a sense, this story plays out just like baby formula. We marvel at how conceited we were to believe that we could make a better baby milk than Mother Nature. Yet, here we were, trying to come up with a healthier fat than fat. Natural fats, including saturated ones are the fats that our bodies have evolved to eat. There is nothing inherently unhealthy about it. Just as breast milk is what our babies have naturally evolved to eat. While this is a marvellous cautionary tale, the relevance is that for many decades, the health effects of trans fats and saturated fats were lumped together because trans fats are saturated. However, the health effects of natural saturated fats are nothing like the artificial trans fats at all. Maybe saturated fats are not as dangerous as might have believed. I think paragraph 7 might need to be corrected where you say that “no amount of data could convince the diehards that dietary fat caused heart disease”. Shouldn’t it say ” no amount of data could convince the diehards that dietary fat did not cause heart disease”? Yes. You are correct. Thanks for catching that. what about hogh LDL, is that a problem? If High LDL is a problem, do saturated fats help or harm? what about high LDL? Do saturated fats help or hurt. Hi Dr Fung – I have just started IF. I also have irregular heart rhythms from time to time, and currently have an implanted heart monitor. Can IF exacerbate any irregular rhythms or Afib? Hi! I’ve been reading this entire series of articles and find it very well science based. However in this one you mention that trans fats are saturated. This information is incorrect; trans fat are almost by definition unsaturated. Could you fix the article to correct this mistake? Thanks!